First off I would like to say thank you to Carol Ashworth for asking me to judge her Level 3 Trial, also a massive thanks to my Scribes/runners for insuring the day ticked along nicely. We started the trial with Tables & Chairs/perimeter, the scents were hidden (clove) underneath the seat of a chair & (gun oil) on a bin lid around the perimeter. This search proved relatively easy for 9/10 dogs. There were some lovely searches from Lorraine & Chester, Jane & Febe, Lyn & Google, Ruth & Luna, Alli & Blueberry, Carole & Alfie, Jan & Mattie, Kim & Remy, and Dina & Bella. It was interesting to watch the dogs work the tables & chairs as it seemed that the scent was drifting up the row of chairs to the first chair (once through the cones) so some dogs were catching the scent at that first chair then when they found no source, they worked really hard to find the correct chair. Well done to those teams that handled this so well. Next was the exterior item search. Gun oil was hidden in the catch of a black box, and cloves was hidden on some jump cables. 6/10 dogs were 100% successful, with 4 only finding 1 scent. Some dogs seemed to struggle concentrating on the item search, and seemed more interested in the actual search area making their handlers work even harder, it seemed that the gun oil was harder for the dogs to find. The successful teams were Lyn & google, Carole & Alfie, Kim & Remy, Jan & Mattie, Jane & Febe and Dina & Bella. Then to the Vehicle Search. Cloves was hidden on the tow hitch of the first vehicle, with Gun oil hidden in the door seam of the next vehicle. 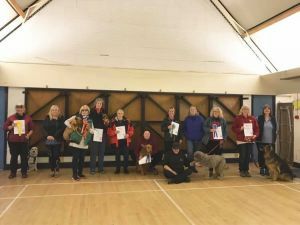 Again 6/10 dogs were successful, these teams were Lorraine & Chester, Anne & Dilly, Jan & Mattie, Lyn & Google, Jane & Febe and Kim & Remy. The remaining 4 dogs either alerted on the wrong vehicle or at the wrong door seam (beyond 6”). Well done to everyone as this was quite a tight search area and made handling difficult at times. Last but not least was the boxes and luggage search, gun oil was hidden on the handle of a large bag while the cloves was hidden inside the bottom seam of a box. Only 5/10 dogs were 100% successful on this search these were Lyn & Google, Jane & Febe, Ruth & Luna, Jan & Mattie and Lorraine & Chester. The remaining 5 dogs alerted on different bags or boxes, there didn’t seem to be a pattern to it, so no specific bag or box was to blame, again the clove scent seemed easier for the dogs to find. On conclusion the trial went very smoothly, 9/10 dogs qualified on the day. All teams worked hard and I saw some lovely handling and rewarding, which is always a pleasure to see. Some of the teams I have judged before so it was great to see Jane & Febe really working together to get the job done. Mattie seems to be growing in confidence being less fazed by the surroundings and more engaged with the search. I got to see Lorraine work her retriever (instead of her mini daschund), who was a fabulously enthusiastic boy and it was great to see Ruth & Luna at a level 3 trial. (A white dog was run for each search area). Entry Fees: £25 per dog. Capped at 10 entries. Only one dog per handler.